Gorabija prepares from the rich fresh dough. Butter carefully to knead, let out crude eggs, to put granulated sugar, a flour and knead dough (dough should be stiff and friable). To spread out dough in hundred-gramme forms, a few having sustained, to overturn on a frying pan oiled and to put in the heated stove. Batch time in the hot stove of 20-30 minutes. Gorabija is possible to prepare and from less stiff dough. 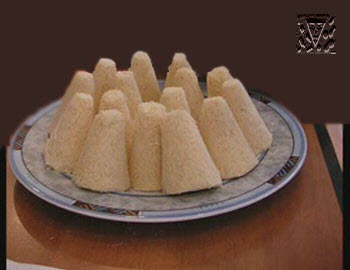 In this case gorabija is baked in forms. On 1 kg of a flour 10 pieces of eggs undertake. 300-400 g sugar, 300-350 g butter, salt to taste. Pie with nuts. In a flour to add cream, the water, a little the melted fat, two eggs, salts to taste and knead dough less stiff, than for house noodles. Dough to divide into seven equal pieces. To unroll one piece a thin layer, to shift on the oiled frying pan and plentifully to grease with melted butter (dough should support frying pan edges). To split walnuts, to crush kernels (if kernels crude, preliminary to dry them in the stove), to mix with equal quantity of granulated sugar and to divide the received stuffing into seven equal parts. One part to strew dough for a frying pan. After that to unroll the second piece of the dough, to strew other part of a stuffing and carefully make gathers dough that the folded circle in size about a tea saucer has turned out, and to put it on a frying pan, on the first layer of the dough. From the remained pieces of the dough to prepare the same wrinkled mugs and too to shift on a frying pan against each other. The pie is put in the heated furnace of average heat. When the pie will blush, to water it from a spoon with in advance prepared syrup (3 glasses sugar, dissolved and boiled in 1 glass of water) and again to put in the furnace. Ready pie to cool, without removing from a frying pan, to cut and, beautifully having laid in a vase, to submit on a table. On 800-900 g flour undertakes: 1 glass of cream, 1 glass of water, 600-800 g crushed walnuts, 20-30 g fat, 1,2 kg sugar for cover nuts and syrup preparation, oil for frying pan greasing.